Register Log In ECN Forum Forums NEC & other Code issues Panel upside down?? I wonder why more installers don't install the panel with the Main on the bottom. Next time you have a situation where the meter is outside and back to back with the breaker panel look at the panel and see if it is universal with respects to bottom fed or top fed. It's a lot easier to install and you won't fill up the gutter space with Service Entrance conductors. I do all I can to enter the enclosure where the terminals are, many of the panels I receive can be mounted either way. If it is easer to have the main at the bottom I will do that. It's a lot easier to install and you won't fill up the gutter space with Service Entrance conductors. I hate seeing the gutters filled up with service or feeder conductors. How about the bending radius? If you are using 4/0 aluminum for a 200 amp panel and you enter the panel enclosure from the back? Will this meet the minimum bending radius for a standard 200 amp panelboard enclosure? Switch boards are not defined in the NEC article 100, all though panel boards are. There is no clear distinction between the two. Switchboard. 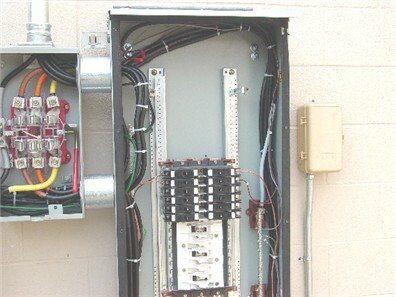 A large single panel, frame, or assembly of panels on which are mounted on the face, back, or both, switches, overcurrent and other protective devices, buses, and usually instruments. Switchboards are generally accessible from the rear as well as from the front and are not intended to be installed in cabinets. A switchboard may have clearly defined vertical sections, a panel does not. I see where I missed switchboard, I didn't look far enough. I have to agree with Pierre that the wire bending space does not fit. Whats up with all those tie wraps ? I dislike seeing tie wraps in a panel - for 1 reason - HEAT ! Man did this thread ever get side tracked. I have had inspectors object to the two more feet of SEC that it takes to reach the bottom of the cabinet and technically they are right in that it is not "nearest the point of entry." In CSA excepted panels there is a dead front over the line terminals so you have to run the supply conductors in through that end of the cabinet. The dead front also prevents you from running branch circuit conductors out of that end of the cabinet. On one old panel type I saw on the air force bases I served on as a lad the cover fasteners were studs with wing nuts and the panel cover would not come off if the main breaker was in the on position. I sometimes think that would be a good technique to adopt in the US for all residential panels when coupled with a Canadian style dead front. Re Russ M's comment: "Also 314.28 has been thrown out the window"
314.28 applies to junction or pull boxes, not panelboards, right? Re Pierre's comment: "How about the bending radius? If you are using 4/0 aluminum for a 200 amp panel and you enter the panel enclosure from the back? Will this meet the minimum bending radius for a standard 200 amp panelboard enclosure?" Does table 312.6(A) apply to the front to back distance? The note in the bottom of the table only mentions measuring in a straight line from the end of the terminal lug (which end? where the wire butts up in the barrel or at the open end of the lug?) to the wall of the panel.